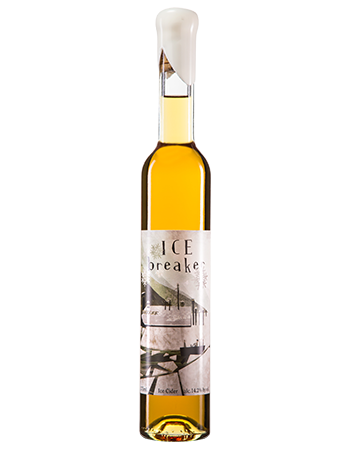 Break the ice with this small-batch ice cider! Ice cider is a unique dessert wine made from cryo-extraction techniques similar to ice wine. It is intensely rich in natural apple flavor, high viscosity, smooth texture, clean acidity, balanced structure and long finish. The braeburn apples supply acidity and natural tannins for structure. Like a fine Sauternes, this ice cider is a supremely pleasurable wine, and one that needs no excuse or pairing for opening a bottle: You can just open it for the sheer pleasure of the thing. (Although it is brilliant when paired with blue cheese!). Serve with buttery desserts, spicy sausages, patès, foie gras and artisan cheeses. Comes in a 375 ml bottle with hand-dipped white wax, perfect for gift giving. Our seasonal, small batch hard cider!